I usually paint little still lifes in my kitchen where there are multiple sources of light — light from the window, lights in the ceiling, lights over the counter — and this results in all kinds of weird overlapping cast shadows, some diffuse and some quite defined. 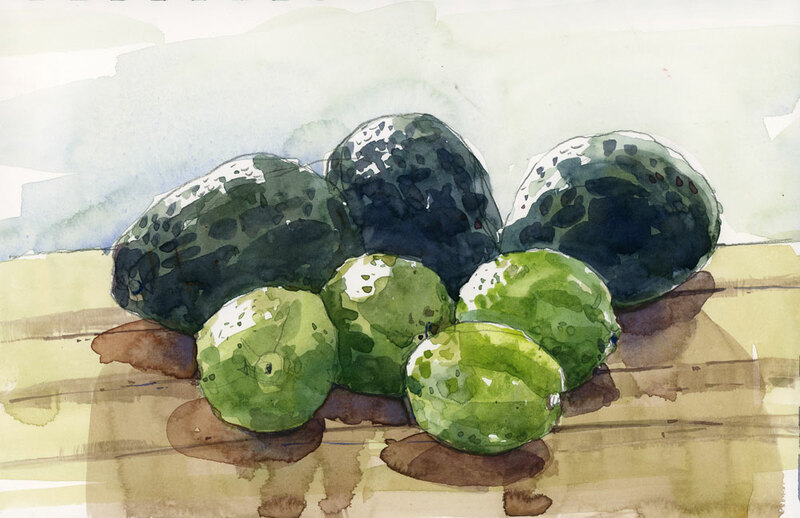 I started this sketch in the morning with only natural light hitting the tops of the fruit, but I had to leave for work before I was done. When I finished it later in the day the daylight was gone and the overhead lights cast much more defined shadows on the cutting board. There’s really only one solution to this problem: quit my day job and get my sketches finished in one sitting. As to quitting your day job….if you sold your lovely sketches and taught workshops? I am sure you would miss your students….and the regular paycheck! I would miss both of those Linda. Mostly the students of course, since now they are my models too. These really pop. Amazing greens! I agree… give up the day job… then you could do two posts per day. How would you keep up with the commenting? I think I would be able to spot the imposter.